Discovery saw big gains thanks to a new sports content deal and an industry-shifting court ruling. Shares of Discovery, Inc. (NASDAQ:DISCA) climbed 30.4% in June according to data provided S&P Global Market Intelligence. Shares climbed following the company's announcement that it had signed a $2 billion deal carry the PGA Tour in territories outside the U.S. over the next 12 years. Discovery's stock also saw substantial gains following judicial approval of AT&T's merger with Time Warner. Discovery's deal with the PGA will see the company make staggered, increasing payments to the golf organization worth $2 billion over the next dozen years. The media company will launch a PGA-Tour-branded streaming service and have rights to carry its content in all markets outside of the United States. 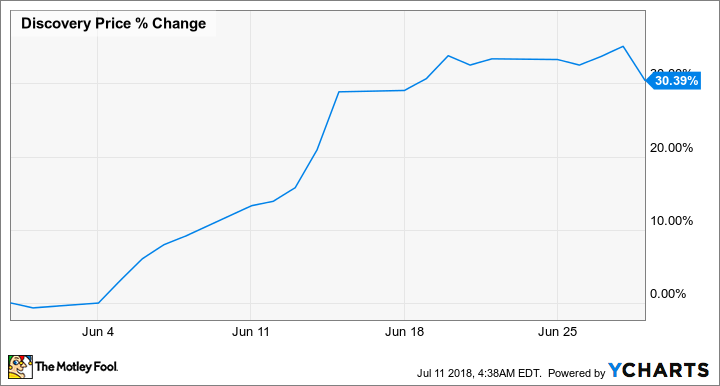 Approval of AT&T's $85.4 billion bid to acquire Time Warner appears to have been the other big catalyst for Discovery's June stock gains. The judicial all-clear arrived on June 12 and set a precedent for continued consolidation in the industry and prompted valuation gains for many major media companies, Discovery among them. Live sports content has long been viewed as one of the most important assets for cable and streaming television services, and golf seems to recently be experiencing an uptick. The PGA Tour recently posted its best ratings in five years. Much of that is likely due to resurgent performance from Tiger Woods and a down-to-the-wire finish, but there are also signs that interest in the sport is seeing a substantial uptick in Europe and China. As for the impact of the new media-consolidation climate in the wake of the AT&T-Time Warner merger, the ruling would seem to suggest that there are more potential suitors than previously expected that could make a successful bid to acquire Discovery. That doesn't necessarily mean the media company will be acquired, but Discovery does have an established brand and specialized content offerings that could fetch higher valuations in a more competitive acquisition market.